Global governance is in crisis. The conventional treaty-based system is struggling to cope with the multiple challenges faced by global society. This failure is evident in various areas, including climate change, protection of labour rights across global supply and commodity chains, global bio-diversity, and more. This governance crisis has motivated the creation of multiple private corporate social responsibility (CSR) schemes that operate alongside the treaty-based system. These transnational CSR schemes include voluntary corporate codes, environmental management systems, various labelling and certification schemes, sustainability reporting standards, and global ranking schemes. Most CSR schemes include both a guiding component (code, standard), and a compliance element. Through their capacity to directly regulate the behaviour of corporations on a global scale, CSR regimes offer a way to circumvent the regulatory weaknesses of the international treaty system. Various authors, however, have voiced scepticism about the credibility of CSR regimes, arguing that they have no real regulatory power. In a recent paper ‘Governance through Global Networks and Corporate Signalling’, published in Regulation and Governance (2018), we study the credibility of CSR schemes, based on a network analysis of an original dataset of CSR schemes and certified firms. We argue that the authority of CSR schemes should be viewed as an emergent, network-based property. The various CSR schemes constitute a multi-layered network of closely connected institutions. A multi-layered network evolves when actors are connected through more than one type of socially relevant tie. To expose the network structure of the CSR system, we analysed it as an affiliation network which contains 49 CSR regimes and 31,987 firms (the data refer to December 31, 2014). Our analysis focused on the induced graph which depicts the relations between the CSR schemes (each node in the graph represents a CSR scheme). Two nodes are connected by an edge if a firm holds a certificate from both (or is a joint member of both). The figure below depicts the results of the analysis of a graph of the induced CSR schemes network. 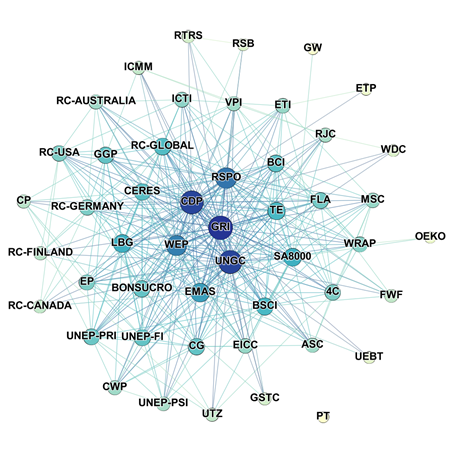 It demonstrates that the CSR system should indeed be viewed as a network and not as a disconnected system of transnational regulators. We show in the article that the schemes are also connected through direct organisational ties. Central nodes with large degrees are denoted by dark filled circles. Peripheral nodes with a small degree are light coloured. Note the single unconnected node of PT at the bottom. We link this structural argument to a phenomenon we call ‘networked signalling’. Firms that want to use their commitment to sustainability values as a way to enhance their reputation must find a way to credibly signal their commitment. We distinguish between firms that join CSR schemes and are committed to implementing their norms (‘genuinely sustainable firms or green’) and firms that join CSR schemes but have no intention to implement them (‘greenwashers’). The challenge for genuinely sustainable firms is to find a way to distinguish themselves from ‘greenwashers’ that may produce false signals. We argue that ‘networked signalling’ (‘NS model’) constitutes a possible solution to this communication dilemma. Firms signal their commitment to sustainability by linking, through certification or membership, to multiple CSR schemes. The inspiration for this argument comes from the model of costly signalling that was developed (independently) by the biologist Amotz Zahavi and the economist Michael Spence. The puzzle at the core of Zahavi and Spence’s work is this: why do animals and humans produce costly and potentially detrimental signals? Prominent examples from biology include the stotting behavior of gazelles, and the peacock’s tail; examples from the economic literature include the costs of an ivy league MBA degree or advertising expenditure. Zahavi and Spence argued that this seemingly puzzling behaviour is a signalling device (which Zahavi called the “handicap principle”). Both people and animals use costly signals to convey their fitness and to distinguish themselves from unfit individuals. In the corporate world, firms use certification or membership in CSR schemes to signal their commitment to sustainability values and to distinguish themselves from ‘greenwashers’. What makes certification or membership in CSR schemes a credible signal is the differential cost structure of multiple certifications. The cost of reliable quality signals is higher for a ‘greenwashing’ firm than for a ‘green’ one. This is because the costs of maintaining a deceitful organisational structure (in which an organisation commits to a CSR scheme with no intention of implementing it), increases with the number of certifications or memberships the organisation holds. These costs reflect both the direct costs of maintaining a decoupled structure and the expected reputational costs that may accrue if the deceit is exposed. When the differential cost condition is satisfied, a separating equilibrium that distinguishes between truly ‘sustainable’ firms and ‘greenwashers’ emerges. According to the NS model firms with multiple certifications should display a stronger CSR performance than do their peers with fewer certifications. To test this hypothesis, we compared our data on multiple certifications with data on global CSR rankings, obtained from Dow Jones Sustainability Indices (DJSI) and FTSE4Good, which are widely considered to be credible proxies for good CSR performance. We found, first, that firms selected as constituents of either the DJSI or the FTSE4Good sustainability indices are more likely to be certified by at least one CSR code, than are firms that were not selected. We found, further that a firm that is certified by multiple schemes is more likely to be included in the indices than one with fewer certifications. By showing that firms with a larger number of certifications demonstrate stronger sustainability performance these findings provide tentative support to the synergistic argument. By demonstrating a positive correlation between certification by multiple CSR schemes and sustainability performance, our analysis shows that certification or membership in CSR schemes is not just cheap talk. Oren Perez is Dean at the Bar-Ilan Law Faculty, Israel. Reuven Cohen is Associate Professor at the Department for Mathematics, Bar-Ilan University. Nir Schreiber is PhD Student at the Department for Mathematics, Bar-Ilan University.